We are happy to announce Preofessor Paul Birevu Myinda as speaker at the World Learning Summit. Dr. Muyinda is a Senior Lecturer and Dean at the School of Distance and Lifelong Learning, Makerere University. He holds a PhD in Information System specializing in mobile and electronic learning. He also holds a Masters in Computer Science and a Bachelor of Statistics. As a lifelong learner, Dr. Muyinda has undertaken and continues to undertake courses that grow his professionalism in open, distance and e-learning/online learning. He has completed a Post-Graduate Diploma in Education (ICT) and Five Months Certificate in Online Facilitation all from the University of Cape Town, SA. Dr. Muyinda is an educational technologist, researcher and consultant. He has implemented a number of educational technology projects in Uganda and beyond. He has research interest in distance education; mobile, electronic, online and blended learning; ICT4E; social media for learning; open education resources (OER); ICT4D; educational information systems; mobile learning app development; and Massive Open Online Courses (MOOCs). Vice rector for education affairs at BI Norwegian Business School is confirmed for our panel discussions, June 14th and June 15th: Dag Morten Dalen has been at BI since 1998. He has a background from working at the Frisch Center, and also the Parliament – Stortinget. He will add and important dimension – so we´re excited about that. An economist with a PhD from the University of Oslo, Dag Morten will help us shed light on the economic and institutional aspects of education´s digital future. We tend to pay a lot of attention to uses of digital media, classroom studies and didactical issues. But what about the economic? Clearly, the ascent of effective and interactive technologies will also have a huge and building impact on education economies. BI in Oslo is perhaps the one institution in Norway that has had the most systematic focus on organisational change when it comes to integration of new learning technologies — through their efforts at BI Learning Lab. We will hear more during the summit. Some of you will remember the story of Maria Amelie, from when she made a media splash in 2011. To some she is a new name. Most do not know that since 2011, Maria has made a space for herself as a blogger, a bookwriter, a journalist and a speaker. And we are very, very fortunate to have her join us at the upcoming summit in Kristiansand, June 14th. Less well known by her real name, Madina Salamova, Maria came to Norway via Finland with her family, in 2002. The family´s application for visa and residence was rejected, as was their appeal. After that last verdict, the family went into hiding. In 2010 Maria published a book about her family´s existence as illegal residents. The book, Illegally Norwegian, became a controversial media issue. Maria was named “Norwegian of the year” in 2010. Her blogposts started to get attention. In 2011 she was arrested after a speaking engagement, and subsequently deported to Russia. A period of intense media mobilisation, protests and support events started. A long story, and also a media spectacle, ended when she was given residency rights in 2011, after which she took up working with the magazine Teknisk Ukeblad, in Oslo. Maria is now working freelance, among other things on a book centering on technology and entrepreneurship in Norway. But why here — at the World Learning Summit? The answer is simple: Maria Amelie has a unique insight into the realities of being mobile, young and on the margins of society — her visions and ideas about the future of learning are truly original, for exactly that reason. We hope many more will come to listen to her. Maria is the bestselling author of three books on immigration and freedom of speech. For the last five years she has been writing about technology and entrepreneurship, following the tech scene in Oslo where she lives, closely. As she says: Her main goal is “to put Norway on the start-up map”. And more: “The challenge of being a refugee and how you tackle it can be a great advantage for life as an entrepreneur, later”. And you know — the great sociologist Robert Ezra Park said the same about Norwegian immigrants to the United States in the 1930´s. It´s about time we also take refugees and immigrants seriously as a resource and not only a problem in Norway, so welcome to you — Maria. Happy to announce Erik Ræstad as speaker on our presentation of Nordic EdTech companies, on June 14th. Erik is the managing director of We Video in Europe, the Middle East and Asia. He has been part of WeVideo since the establishment of the company back in 2011. He discovered WeVideo as a former strategy consultant in the media sector, working with digitalization of newspapers. Now, Erik spends most of his time supporting educators and journalists with digital storytelling – as a learning platform or a means to communicate news. We at the Future Learning Lab discovered WeVideo in California in 2012, not too long after the company was launched. WeVideo is a great Norwegian entrepreneur story! We urge everyone to check out their website and approach to learning. And we look forward to hearing more at the summit. By 2016, WeVideo is a cloud-based collaborative video and visualization tool with millions of users, preferred by Google, Disney and many other global companies. But it all started at Bryn, in Oslo…. One of the key players is also the founder of the Fronter LMS. No kidding. More on their blog and homepage. 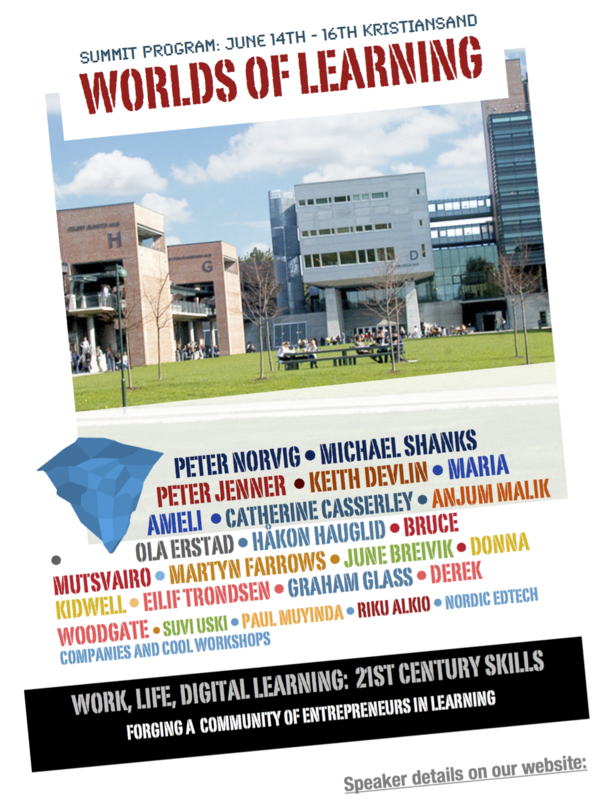 Here is a blogpost from Future Learning Lab´s home website: The collaboration below will be presented at the World Learning Summit, in Kristiansand June 14th-16th.